Choose the week and day to visualize each workout on the same screen. Tap on "GO" to begin your workout. works with any MP3 player and includes workout music. works with any MP3 player and uses your own music. What is the Ease into 5K running plan? 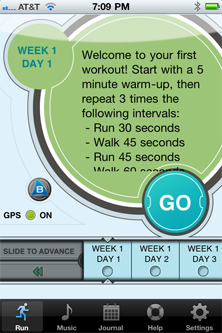 Ease into 5K is a beginner's running plan created by Bluefin Software, LLC. Why do I need an app for that? Journal your workout thoughts - document the weather, how you felt, and terrain. Add your own comments in the notes box. Facebook and Twitter right from the app - your friends will want to motivate you on your journey and you'll want to feel accountable too. What do I do if app is misbehaving? How do I advance to the next day? How do I post to Facebook/Twitter? Do you have an app for 10K?